Have you ever wanted to see your Mii life sized? 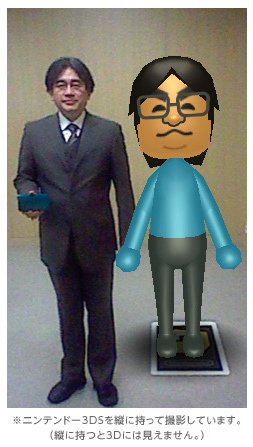 Iwata did, and ClubNintendo is willing to let us indulge ourselves through Jumbo AR cards. One lucky guy was also able to get a few during a 3DS Street Pass Event. Currently, these AR cards are set for release as a ClubNintendo award for those who live in Australia. It also appears to be available to Japan, so hopefully those who don’t live in those areas might have a chance of getting these cards. You need to have 750 Star Points, but I’m sure most of you have had no problem accumulating the needed amount. The card allows you to make a life sized Mii, as well as a life sized Mario on his own jumbo AR card. You’ll be able to stand next to Mario! Here is a video of a lucky guy who was able to get a few of them. From it, you can see that these are of high quality. Not only that, but when he puts the regular AR cards next to the new ones, you can see just how JUMBO they are in comparison. There are a few people who have tried to print these on their own, but these will be official. Would you like to see these available through the ClubNintendo of your region?